Illinois Pension Crisis: This Is What Rock Bottom Looks Like : It's All Politics Lawmakers will head back to work next week to try to patch the state's $100 billion pension hole. Every day they don't act, the burden on Illinois taxpayers grows larger. Illinois Gov. 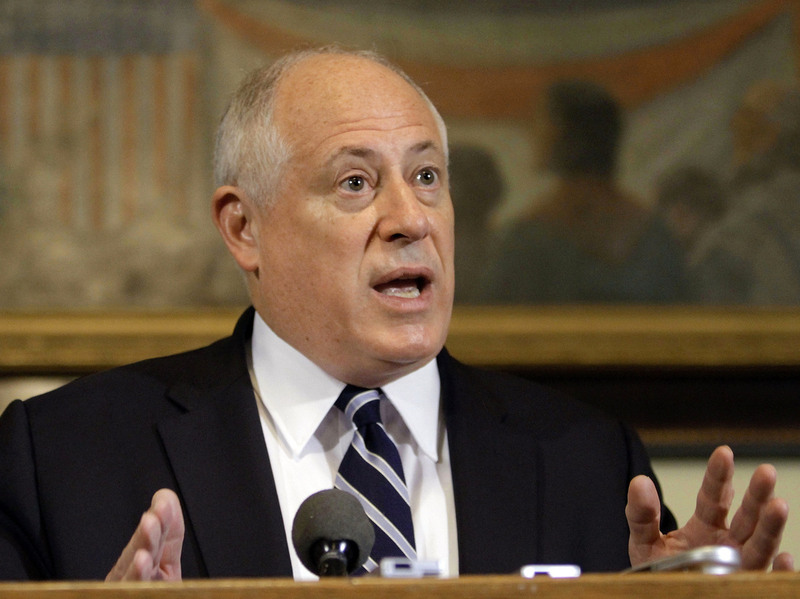 Pat Quinn called members of the Legislature back to work for a special session to help resolve the pension crisis. Lawmakers in Illinois are headed back to work next week to address the state's $100 billion pension crisis, the worst unfunded pension liability in the nation. While almost all states faced pension funding issues during the recession, none of them are looking at a predicament as severe as in Illinois. Every day it doesn't get fixed, the burden on taxpayers grows larger. "They are in the most dire situation of all the states," says David Draine, a senior researcher at the Pew Center on the States. "Illinois is facing a growing bill that it hasn't figured out how to pay for. The other poorly funded states have at least some sort of plan." The pension issue boils down to simple math. States failed to put away enough money to pay what they've promised their employees for their golden years. Since many public sector employees aren't covered by Social Security, their pensions are often their only retirement safety nets. When the recession hit, dozens of states saw hits to their pension investments and found themselves overburdened. The National Conference of State Legislatures says that since 2009, 48 states have passed what they consider "significant" reforms to commit themselves to pension payments going forward. Just how dire is the situation now? Each day without a fix digs the Illinois pension hole at least another $17 million deeper. After two recent downgrades, Illinois' bonds are only a few steps above junk status. S&P say that only three states — California, Louisiana and Massachusetts — have ever had ratings as low as Illinois' current level in the last half century. The low rating makes the fiscal situation even more grim, as the state will see its borrowing costs, already among the highest in the nation, rise yet again. "Every time they want to build a bridge or new school, it's going to make it more expensive, and possibly a lot more expensive," Draine says. The news doesn't get better from here. The longer action is delayed, the heavier the burden on the Illinois taxpayer. If costs keep rising at the current rate, balancing a budget would require crowding out funding for core government services. "That leaves less money for schools and roads and bridges and prisons and everything the state should be doing," says Draine. Already, public university debt grows steadily, prison populations are at all-time highs, and nonprofits serving the needy are experiencing delays in getting state payments. Since the state constitution says public employee pension benefits "cannot be diminished," that means any changes to the way benefits are calculated will likely be met with a slew of lawsuits. Worse, workers may have to delay retirement in order to make ends meet. And then there's an extreme consideration: "In theory, if it gets bad enough, the money won't be there for retirees," says Draine. If the pension fund becomes insolvent and that state really can't pay up someday, today's middle-class public servants could wind up tomorrow's impoverished seniors. The specter of these situations hasn't yet moved leaders to agree on a path to reform. Since last summer, Illinois leaders have failed three times to pass pension reform bills. The most recent blown chance came just weeks ago, when the Legislature adjourned without getting a bill passed. "Their inaction was the equivalent of tying a 32,000-pound weight around the neck of every taxpayer in Illinois," Madeleine Doubek of Reboot Illinois, a digital effort to engage citizens in the fiscal crisis, told NPR's David Shaper. She said $32,000 is what every Illinois taxpayer would be responsible for in order to cover the pension shortfall and pay off a backlog of bills. To try to resolve the crisis, Illinois Gov. Pat Quinn, a Democrat, called lawmakers back to work for a special session of the state Legislature. "This is an alarm bell for the speaker of the House, the president of the Senate, all the members of the Legislature, to come together and get the job done. The job is, put a bill on my desk so I can sign it into law," Quinn said. It's unclear whether that job will get done. The reform plans previously put forth by the Democratic-led House and Senate differ widely. While both proposals made up some money, the House plan was significantly more aggressive and would dig the state out of debt faster. But no compromise is in sight, even in a state where one party holds all the levers of power. During the regular session, political infighting between leaders in the two chambers kept the House bill from getting a vote in the Senate. "I'm not sure what dynamics have changed in this pension reform discussion," Illinois Senate Republican Leader Christine Radogno said in a statement. She's not the only one unconvinced. "The Democrats control everything in Illinois, but they are not unified. They are beneficiaries of labor support, and labor is not very happy because of the pensions proposals," J. Fred Giertz, an economist at the University of Illinois, Urbana-Champaign, told The Christian Science Monitor. "I don't see any end in sight to the problem. I see them muddling through." The clock's ticking. Researchers at Boston College say without a fix, Illinois could run out of money to pay its retired state employees within the next 15 years.